SPECCHIO Wifi Photo Frame – Consumers Like Highly Reflective LCD Displays Right? | OhGizmo! 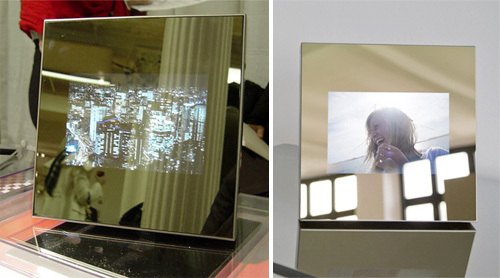 SPECCHIO Wifi Photo Frame – Consumers Like Highly Reflective LCD Displays Right? By Andrew Liszewski on 11/12/08 • Leave a comment! It seems the product designers at Parrot, or in this case designer Martin Szekely, haven’t gotten around to reading any of the reviews of the new MacBook or MacBook Pro. If they had, they would have discovered that consumers (or reviewers at least) aren’t that into highly reflective glossy displays that make it easy to see yourself, but not necessarily what’s on the LCD. And claiming that the digital photo frame can also double as a mirror just doesn’t cut it. It’s too bad though because the SPECCHIO includes wifi (b & g) and bluetooth and can receive photos directly from a cell phone or via email, an RSS feed or your Picasa/Flickr account. There’s no pricing or availability info for the SPECCHIO frame at this point, but a similar ‘designer’ frame in the Parrot online store runs $449.99, and I don’t expect this one will be any cheaper.